Ok, let me start by saying that this is currently my absolute favourite cookbook. 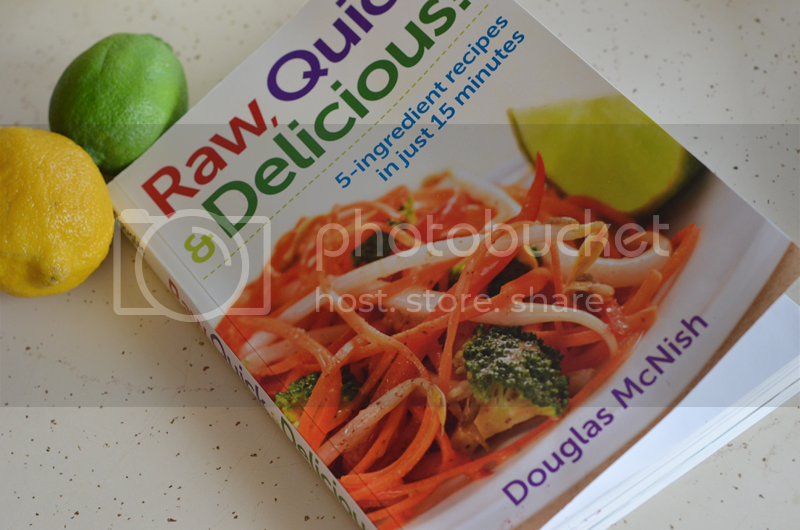 In fact, Raw, Quick & Delicious by Douglas McNish might even be my all time favourite cookbook. I got a copy to review a few months ago and I flipped through it, tabbed some pages and then it got set aside because I was busy. A few weeks ago Ivan mentioned that he wanted to start eating more raw food so I pulled out this cookbook and I've been making so many recipes from it it's ridiculous. I have made so many recipes and I'm going to list them quickly just to give you an idea of all the great things in this book: Nut Milk, Hemp Milk, Cauliflower Mashed Potatoes, Teriyaki Sauce, Creamy Alfredo Sauce, Spiced Nut Crumble, Strawberry Cheesecake Smoothie, Easy Italian Dressing, Sesame Garlic Dressing, Zucchini Fettuccini Alfredo, Carrot Pad Thai, Lo Mein Stir-Fry, Lime, Tomato and Avocado Chili, Curried Cashews and Mixed Vegetables, Vegetable Fried Rice, Sheperd's Pie, Mushroom Tart, Exotic Cauliflower, Cheesy Broccoli, Chunky Banana Cacao Soft Serve. See?! Isn't that a huge list? There are so many other things to try. I haven't even tried any Breakfasts or Snacks and only one Smoothie and Dessert. Everything I have made is absolutely delicious and so easy to make. I love that basically everything can be prepared ahead of time so I'm not trying to make sure that dinner will be hot and ready by the time Ivan gets home. If I have time to make dinner at 2:00 pm that totally works because I can just prep it and stick it in the fridge. Another great thing about this cookbook is that a lot of recipes call for the same main ingredients. Cashews, walnuts and almonds are used a lot so as long as you have those things on hand as well as a few vegetables and pantry staples, you can make something. That's good for me because I'm not awesome at strict meal planning. We have basically stopped eating out because we always have the ingredients to make something delicious. A really awesome addition to the book is the 'Tips' that Douglas gives in the margin of each recipe. There are so many fantastic tips about certain ingredients, procedures, storage, etc, used in the recipe and I have learned a bunch of new things from them. Amazing. Another thing I love is that some recipes call for 'In the Pantry' recipes but also give you a quick alternative if you don't already have that particular thing made. I really, really love that because sometimes it bugs me to have to flip to a different page to make sure I have all the ingredients to finish the recipe. It's not a huge deal but I just like being able to stay on one page when I'm making something. I have made very good friends with the food processor and blender. I think pretty much every recipe calls for one or both of those kitchen gadgets so if you don't have either then this cookbook may not be for you. 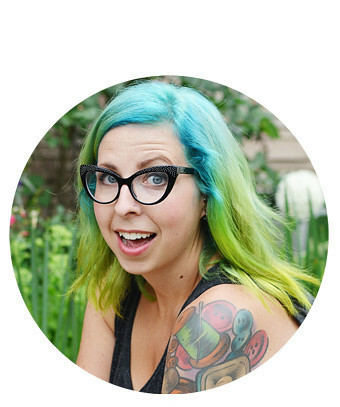 Holy smokes, can you tell I'm really excited about this book? If you are at all interested in introducing some raw dishes into your life, Raw, Quick & Delicious is a great place to start because the recipes are so easy and so good. I was sent this book for free but I would absolutely buy it again if something ever happened to it. Ivan and I are really in love with raw food at the moment so if you have any favourite raw cookbooks let me know! I wanna eat raw food a week in summer time, I heard its pretty good for your soul, health. But I need cooked food to feel good and I heart fried eggs hehe, might be an habit since I know a slovenian girl who eats raw food for 5 years, but you gotta be creative, otherwise you get sick of the food. Thanks for the recommendation I will have to check this out! We are really trying to stay away from eating out but with time being so precious that sometimes means we eat the same basics over and over and over but some variety would be nice! No, I guess not! From what I've seen raw food in general usses a lot of nuts. Definitely a bummer for people with nut allergies. Ooops, I meant to add that a lot of times sunflower or pumpkin seeds can be substituted. You NEED to see that amazing food!! This sounds very exciting! I will definitely be buying this book. I am all about healthy and easy! Thanks for the recommendation! I'll be buying this book! I love both books by Judita Wignall (Raw and Simple; Going Raw). Raw and Simple is the newest one and it's wonderful. I just bought the book you suggested and am excited to make things from it! Oh, I'm gonna get this one then! Thanks, I'm always looking for new raw books!